(Leah Hogsten | The Salt Lake Tribune) Utah Sen. Mike Lee in June 2018. The way some local public officials talk about public lands in Utah is as nonsensical as the mayor of Detroit demeaning the auto industry or the governor of California wishing Disneyland would go away. Sometimes I wonder if it takes the view of someone who didn’t grow up around here to see that. 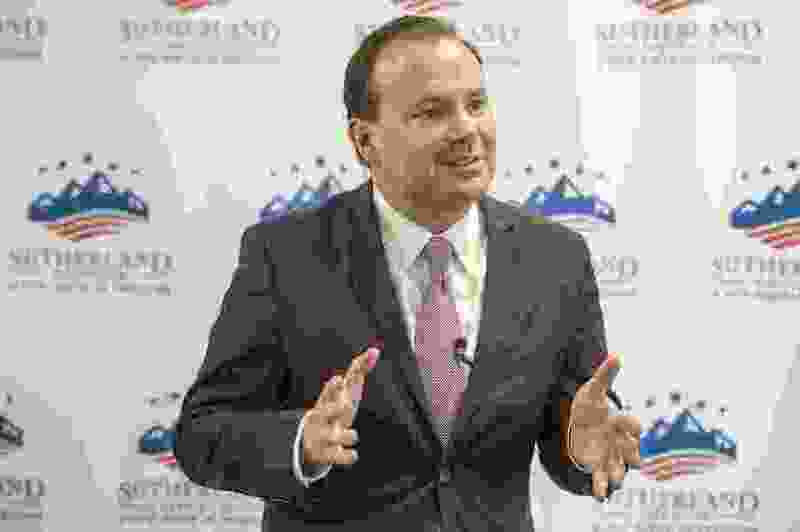 Take, for example, Utah’s Sen. Mike Lee, who has lived his whole life either in wonderful Utah or evil Washington, D.C. When he discusses land and development, he seems to have no clue that the population is growing in cities and shrinking in rural areas all across the nation, even — particularly — in states that have little or no federal land. And apparently he has no clue that those evil New Yorkers, who are among those he holds responsible for locking up all that land in Utah, have also locked up about a fifth of their own state in the form of Adirondack State Park. Reducing that preserve by 1 acre requires an amendment to the New York State Constitution. In a speech to the conservative Sutherland Institute earlier this month, Lee again spouted the revisionist history view of how the mean old federal government, as the nation moved west, stopped selling off the major portions of each state and wound up keeping ownership of giant swaths of states such as Nevada, Idaho and Utah. Lee allows as how the change in behavior was in large part due to the fact that small farmers could make a go of Homestead Act grants of 160 acres or so as Manifest Destiny moved through Ohio, Iowa, Kansas and even Colorado. But, once west of the Rockies, settlers found the land far too barren to support the Little House on the Prairie, so most of it continued to sit in the federal larder. Unless it was really useless, in which case we gave it to the Indians. That was fine with some people, who took advantage of what was then Washington’s habit of heavily subsidizing mining and grazing at prices that were, and remain, far below what the market charged for the same activities on private land. The change of view on what should be done with public lands also coincided with a national change of mind of lots of things. Like ending slavery, allowing women to vote, creating large national parks and national forests and other more humane and far-sighted ideas. Lee is among those who today argue that all that land should have been turned over to the states. Actually, the passages of relevant laws he misquotes or misapplies were about selling the land to private interests, and giving each state a cut of the profits. But Lee is probably hesitant to say that because such a sell-off would much more clearly be for the purpose of carving up, digging up and fencing off millions of acres. The senator went on at some length comparing federal ownership of Utah to royal ownership of English land centuries ago. It was a situation where kings and nobles pushed the common folk off the land so they could hunt deer and grouse as they pleased. There’s naught wrong with craft breweries and artisanal coffee shops, lad. There are folks, more and more of them every year, making honest livings in those businesses, providing jobs, paying taxes and not destroying the land in the process. There’s also no comparison between land seized by Prince John and land that has always been held in common for all of the American people. What Lee doesn’t seem to grasp, or to like, is that all that federal land, by law and by right, belongs to each of us. Yes, even fans of craft breweries. And me. It belonged to me when I lived in Kansas. It belonged to me when I lived in New York. It belongs to me now. It will belong to me when I can’t afford to retire in the U.S. and move to Belize. It also belongs to my brother in Japan, my cousin in England, my cousins in Arkansas, South Dakota and Illinois. Even if they never see it. It is Lee’s hope, not Teddy Roosevelt’s vision, that would amount to the biggest land swindle since the Louisiana Purchase. George Pyle, editorial page editor of The Salt Lake Tribune, notes that Mike Lee left “quaint used-book stores” out of his list of evil incursions into wild Utah.